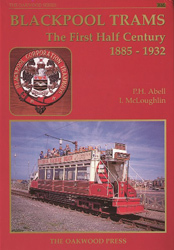 Taking 30 years of research, and three years to write, this is the first book to give a full detailed history of the early Blackpool tram fleet covering all trams built, from the conduit days (1885) to the year before the ‘Streamliners’ first arrived (1932). For the first time there is also a complete record of all works and illuminated cars constructed or converted from the 1885-1932 fleet. This book is an essential work for the tramway and transport historian and tramway modeller alike. A5 format, 224 page, 200 illustrations.